“Global Choke Point,” a collaboration between Circle of Blue and the Wilson Center, explores the peril and promise of the water-food-energy nexus with frontline reporting, data, and policy expertise. Until two years ago, when the National Wildlife Federation pointed out their presence, the 61-year-old steel oil pipelines running beneath the fast-flowing Mackinac Straits between Lake Michigan and Lake Huron were like nearly every other piece of North America’s energy transport network: out of sight and out of mind. Now, as awareness grows after a series of spectacular and deadly spills over the last four years, activists are demanding they be removed or reinforced. The North American fossil fuel boom is directing more attention than ever to the management, safety, and disruptive changes in the pipeline and rail transport systems that ship oil and gas to market. The continent’s new energy reserves, from Alberta and Saskatchewan to the Dakotas, Montana, Colorado, Texas, and the U.S. East, are located in areas not always well connected to the conventional markets, refineries, and customers developed in 20th century, or to the growing 21st century roster of terminals under construction for exporting fuels. Oil and gas, in effect, need more ways to get to market. Energy companies are engaged in a continental campaign to build infrastructure to match the new geography of supply. Piece by piece the energy industry is assembling an expanded circulatory system for moving oil and natural gas. But there’s no systematic national plan for developing these energy corridors in ways that minimize risk. The route of the Keystone XL pipeline, which would link Alberta to the Texas Gulf is the most visible example and a focus of national protest (the proposed route crosses a sensitive aquifer in Nebraska that citizens and the state’s governor want to protect). But the same challenge has arisen elsewhere, bringing tensions and danger to small towns in North America’s empty quarters. Over the last two years, trains carrying oil from Canada and the Dakotas have exploded in Aliceville, Alabama; Casselton, North Dakota; and Lac-Mégantic, Quebec, causing loss of life and property. In 2010, a pipeline carrying oil to a refinery in Detroit from the tar sands region of Alberta ruptured in southern Michigan, spilling nearly 850,000 gallons of sticky crude into the Kalamazoo River. The scale of pipeline construction is astounding. Industry analysts forecast that an average of nearly $50 billion a year will be spent by 2025 to create pipeline and rail networks that connect natural gas reserves in British Columbia and Pennsylvania and oil fields in Alberta, North Dakota, and Texas to refineries, processing plants, and coastal export facilities. Older pipelines are being enlarged and the direction of flow is being reversed to accommodate the unexpected bounty of hydrocarbons wrought by hydraulic fracturing (“fracking”), tar sands, and other new extraction techniques. Jeff Wright, director of the Office of Energy Projects at the Federal Energy Regulatory Commission, the U.S. regulator for natural gas networks, says that a “tsunami of new pipelines” is imminent. As many as 18,000 miles of new, expanded, or refurbished crude oil pipeline – enough to string two Earths like a chain of pearls – will be put in the ground in Canada and the United States by 2018, according to IHS Global, a consultancy. Since the boom began in 2008, the U.S. crude oil system has expanded by 20 percent. Some 3,448 miles of crude oil pipeline were added to the U.S. system in 2013, increasing its length by 6 percent, according to federal government data. The country’s railroads are seeing comparable growth. Analysts estimate a two-year production backlog for new rail tanker cars designed with stricter safety standards. “[The map] has been reshaped entirely,” Ken Medlock, an energy economist at Rice University’s Baker Institute, told Circle of Blue. Most people 10 to 20 years ago would have told you that energy infrastructure would be developed to move product from the coast in, because we’d become an increasing importer of both crude oil and natural gas. And today you’re actually seeing the exact opposite begin to emerge. We’re going from the middle of the country to the coast and trying to find ways to export. As the broadest expansion in decades of fuel transport capacity unfolds, the public is becoming increasingly aware of the potential for leaks, fires, and water contamination. According to Tom Miesner, a 35-year veteran of the pipeline business and principal of the consulting firm Pipeline Knowledge and Development, the challenge for the industry is twofold: the outward growth of cities, which brings more people closer to pipelines that were located in fields or forests when originally built, and the pipelines’ proximity to water sources, where the environmental damages from a spill and the cost of cleanup are significant. “For crude oil pipelines, the highest risk is where you have people and water because that is usually where the consequences of a release are greatest,” Miesner explained. Opponents of the Keystone XL pipeline, the most visible of the proposed delivery routes, believe that stopping the project will help prevent Canada’s tar sands, one of the world’s most expensive and dirtiest sources of oil, from being developed. That logic, though, is being turned on its head by rail transport. In just two years, exports of oil from Alberta to the United States by rail have shot up 813 percent. Rail shipments of crude oil within the United States are nearly off the charts – a 3,654 percent increase since 2009. In the Bakken oil fields of North Dakota, for example, production outpaces the region’s pipeline capacity by 450,000 barrels a day. What cannot fit into a pipeline is shunted to a growing fleet of rail terminals and then out onto tracks in 100-car trains. Meanwhile, new rail terminals to unload these trains and new tracks for them to run on are being proposed for riverside and maritime locations from California and Washington to New York. Increases in rail traffic are creating congestion where they cut through towns and cities. More oil by rail means less space to move a record grain harvest in the Midwest to market, for example. By “less desirable,” Barteau means moving oil by rail. The rise of rail transport has raised questions of risk and inadequate infrastructure, questions underscored by several high-profile accidents. Those who analyze risk see it as a combination of two variables: both the likelihood of an accident and its consequences. The chances of any given pipeline breaking are small, but the consequences are significant if the rupture happens in a suburban neighborhood or under Lake Michigan. Crude oil pipelines pose a greater risk to sources of water than natural gas lines because of the cost of cleaning up liquid fuels. Though none of the experts interviewed for this story could provide data comparing rail spills to pipeline spills – a persistent problem for all pipeline risk calculations – they agreed that rail transit results in more accidents than pipelines but smaller volumes spilled. A year ago, a train carrying oil from North Dakota’s Bakken fields hit a derailed grain train and crashed, spilling 396,000 gallons of oil onto the prairie. In July 2013, an explosion following the derailment of a train also carrying volatile oil from Bakken killed 47 people in Lac-Mégantic, Quebec, spilling at least 26,400 gallons into the Chaudière River. In both cases, the trains were using an older model of tank car that is easily punctured in an accident. Federal regulators in Canada and the United States have recommended phasing out the old cars, but a complete turnover in stock will take years. Pipeline spills, which are less frequent than rail accidents but often result in larger releases, can pose an even greater environmental risk to waterways. The worst was the 2010 Kalamazoo spill (845,000 gallons of diluted bitumen), which grew larger when the Enbridge operations staff misinterpreted emergency signals and failed to shut down the line. Cleanup costs have passed $1 billion. An Exxon pipeline across the Yellowstone River in Montana ruptured in July 2011, spilling roughly 47,250 gallons of oil and causing $135 million in property damages. Investigators found flood waters had scoured the river bed and exposed the metal. While pipeline operators are required by federal regulation to bury pipes at least four feet deep, they are not required to maintain that depth of cover over the lifetime of the pipe, even though rivers are dynamic earth-movers and exposure to debris in open currents can led to a collision and rupture. Older pipelines are another concern. Half the pipelines in the United States were built more than 50 years ago. A March 2013 spill in Arkansas, a case that federal regulators are still investigating, came from a pipeline roughly 60 years old. Michigan’s U.S. Senate delegation along with state officials has questioned the safety of the 61-year-old Line 5 through the Straits of Mackinac. Enbridge insists they are safe and increased the amount of oil running them by 10 percent last year. Determining the condition of the nation’s pipelines, however, is not so easy. For one, important data is missing. Reliable statistics on the number of minor leaks and near failures – cracks that should have been detected before reaching such a state of disrepair – are not available, said Oliver Moghissi, director of the Materials and Technology Center at DNV GL, an energy consulting firm. Pipeline companies are supposed to keep detailed records of inspections, defects, and maintenance, but they are not required to keep such records for all pipelines, nor are they required to submit records to regulators, said Weimer of the Pipeline Safety Trust. The communities closest to rail and pipelines often feel like they are not in control of the decision-making process because projects are usually approved at higher levels of government, says Moghissi. This creates a magnified perception of risk. Local governments are increasingly using the few tools at their disposal, however. The Appellate Court in New York, for instance, ruled in July that local governments can block hydraulic fracturing for natural gas under home rule land-use regulations, while the city council in Vancouver, Washington, passed a resolution opposing an oil terminal at a nearby port on the Columbia River that would handle 360,000 barrels per day from rail cars – almost half the capacity of the proposed Keystone XL pipeline. Aware that a spill in the Straits of Mackinac would setback a thriving fishing industry and tarnish one of the state’s top tourist destinations, the Michigan Department of Environmental Quality (DEQ) earlier this year requested from Enbridge operation and maintenance records for Line 5, as well as information about the composition of its oil deliveries. “Even though we don’t have regulatory authority over the pipeline, we have a constitutional duty to protect Michigan’s natural resources,” Brad Wurfel, Michigan DEQ spokesman, told Circle of Blue. A state task force is reviewing the documents and will offer recommendations by March 2015 for responding to a spill. Land and water advocacy groups argue that a task force, while an encouraging first step, is insufficient on its own. 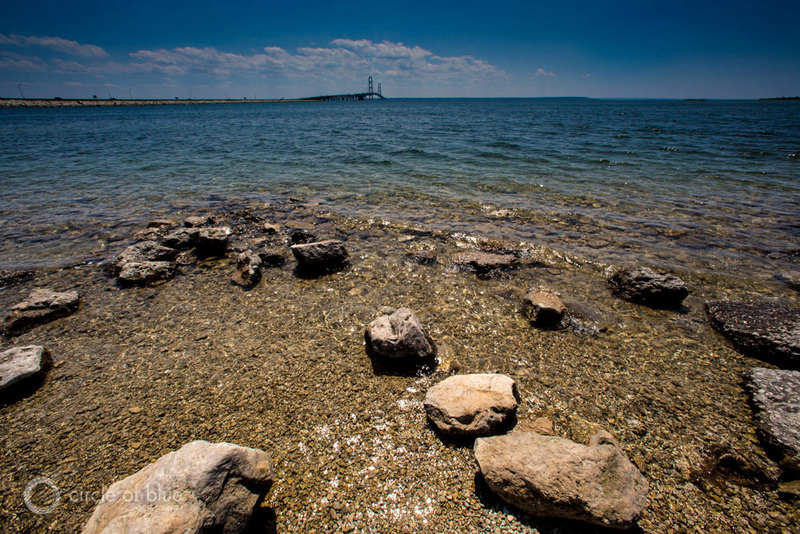 FLOW, an organization based in Traverse City, Michigan, that supports protection of natural resources for public use, is part of a coalition of like-minded groups that want the state to assess the potential harm from a Line 5 spill and exercise greater oversight over the pipeline. “As things stand, Enbridge holds all the cards,” Liz Kirkwood, FLOW’s executive director, told Circle of Blue. “We want to open up the process and get the state to evaluate the pipeline and make decisions in full disclosure.” Those decisions, Kirkwood said, could range from restrictions on the type of fuel carried in the pipeline to a decommissioning and re-routing. North America’s fossil fuel boom, though temporarily slowed by a collapse in oil prices, is steadily reshaping the continent’s already expansive oil and gas transportation network. The development of new pipeline and rail connections is also producing strong civic pushback by local leaders who worry about the damaging consequences of oil spills for land and water resources and the potential for deadly rail crashes. Concerns about the energy sector’s collision course with water are nearly universal. As explored in the Wilson Center and Circle of Blue “Global Choke Point” project, alarms over the energy sector’s role in water pollution and consumption are being raised in China and India as well. In the case of North American fuel transit, inadequate regulation, monitoring, and uneven data collection undermine public confidence that the production and delivery of energy reserves is not also destroying livelihoods. In China, this concern is most visible in the huge open-pit coal mines in the country’s dry north. In India, the central government faces pushback both natural and manmade, as unprecedented flooding threatens Himalayan hydropower projects and courts challenge coal mining over water quality concerns. In the background are concerns about the global climate – that burning the hydrocarbons flowing through North America’s pipes and extracted from Asia’s earth will led to irrevocable changes in water availability. Like the twin pipelines beneath the Straits of Mackinac, the world’s relationship with fossil fuels cuts directly across its relationship with water. For more from the “Global Choke Point” project, visit Circle of Blue and the Wilson Center’s China Environment Forum. Brett Walton is a reporter for Circle of Blue writing about agriculture, energy, and the politics and economics of water in the United States. Brett also writes the Federal Water Tap, Circle of Blue’s weekly digest of U.S. government water news. Photo Credit: The Mackinac Straits, connecting Lake Michigan and Lake Huron, used with permission courtesy of J. Carl Ganter/Circle of Blue.